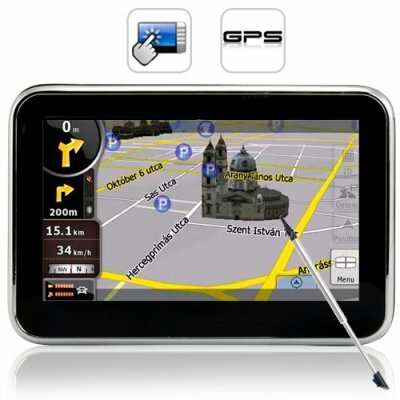 Successfully Added Portable GPS Navigator and Multimedia Player (4.3 Inch Screen) to your Shopping Cart. Ultra-thin and stylish, this Portable GPS Navigator and Multimedia Player comes with a 4.3 Inch Touchscreen and offers amazingly easy-to-use and accurate GPS auto navigation on the go. Touch the simple menu on the large 4.3 inch LCD touchscreen to get an instant route to virtually anywhere in seconds. This portable GPS navigator includes an intuitive interactive screen which shows your route and position on the map, distance to destination, arrival time, street names and much more. You can even access previous routes or points of interest and rely on the voice guidance to offer worry-free directions without even looking at the screen and even though a stylus is included, the portable GPS navigator's touchscreen is so accurate that you can even use your fingers for maximum convenience. This portable GPS navigator uses the newest SiRF Atlas IV GPS receiver and built-in high-sensitivity antenna to this portable GPS navigator one of the most powerful and reliable navigation systems in the industry. Along with functions like offroad recalculation, and 2D/3D maps, you'll have nothing to worry about on the road. This GPS navigator also uses Windows CE 6.0 to provide compatibility with most brands of GPS software. This portable GPS navigator is also a fully functioning handheld multimedia center that supports up to 16GB of your favorite music, movies, pictures, and e-books. Play MP3 files through the built-in speaker or plug in your 3.5mm earphones to enjoy AVI and other video clips on the 4.3 inch screen. You can even use the FM transmitter to broadcast sound directly to your car speakers for an even better audio experience. Ultra-thin, pocket-sized, wireless and fully self-contained, this portable GPS navigator lets you easily find your destination and have fun while you travel. Available in our warehouse now for single and bulk purchases, so order now and we'll ship it out tomorrow along with our famous 12 month guarantee. Brought to you by the leader in wholesale electronics - Chinavasion. How do I install new GPS software on this portable GPS navigator? Simply put the installation files on the micro SD card or onto the portable GPS navigator's internal memory. Make sure to delete the default one (iGO8) before installing a new one. We want to install iGO as the GPS software. Is this possible? This portable GPS navigator should work with iGO, however Chinavasion does not hold any responsibility for the installation of GPS software/maps. Does this portable GPS navigator come with an antenna? Why did my sound disappear all of a sudden? Turn the FM transmitter off. Does this portable GPS navigator support the _____ language? The supported menu languages are listed above, however, GPS language is based on GPS software itself. Please be sure the GPS software you purchase has your desired language(s). I changed something in Windows Explorer mode and now my computer doesn't recognize this GPS navigator, what's wrong? Go to Control Panel > usbClientSwitch. Select Mass_Storage_Class and then click change. on 2010-09-10 17:26:15 Very good device, recommend!!! It is a very good GPS device. does not require any additional cables if you want to connect to car's radio. Had my doubts about the GPRS software for this device, but was amazed at how good the built in GPRS software is. Another excellent product from Chinavasion. Touch screen, music / video player and GPRS. Xcellent.